Hang It! For Breast Cancer Research-We’ve done the work you have the fun! Last month we described a fabulous in-shop promotion to engage your customers and make a contribution to the research effort to beat breast cancer using the Hang It! 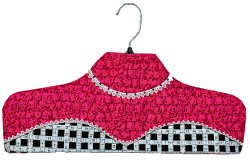 pattern from our best selling book Eazy Peazy Gifts. Here is a link to the Eazy Peazy Home Page on our web site where you can download pdfs for a bag stuffer and a POS placard that may be customized with your shop's name and logo. The contest is Eazy. Customers simply make and personalize a Hang It! which are then displayed in your shop during October, Breast Cancer Awareness Month. The winner of the most creatively embellished Hang It! is determined by voting done during the month and at $0.25 per vote a nice contribution will result for Breast Cancer Research in the name of your shop. 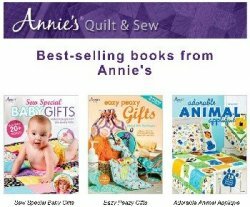 A free two-hour class makes a great kick-off and of course your shop will have added sales from the book (SRP $9.95), fabric and materials needed. Each Hang It! 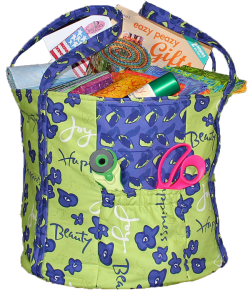 requires three fat quarters and some batting plus rickrack, binding, ribbons…almost any embellishment you can think of. Heartfelt Quilting (Lakeland, Fla.) hasn’t had a kick-off class yet but in one day shop owner Pat Roberts tells me they sold 24 books. Lisa Mullins of Wandering Stitches (Orlando, Fla.) came up with this great promotion and is using it in her store. There are tote patterns and then there are TOTE patterns. Our latest is aptly named “The Everything But The Kitchen Sink Tote” because it is ideal for carrying most anything you can carry. Finished size is a generous 16" diameter by 15" deep. The bottom is stable for easy packing and the Kitchen Sink Tote may be either fully or partially interfaced. Whether you’re going on a shop hop, taking a quilt class, a quick trip to the grocery store or a family day at the beach, the padded handles fit comfortably over the shoulder. And one of its best features is it collapses when for storage and rolls for easy carrying on the way to the store. Kitchen Sink Tote is constructed with two 16" round Bosal Craft-Tex Placemat forms and Pellon 987F Fusible Fleece or Bosal #426LF Light Fusible Batting.